Players at Baseball For All's 2017 Nationals in Rockford, Illinois. It's been more than 60 years since the All-American Girls Professional Baseball League ended its run. 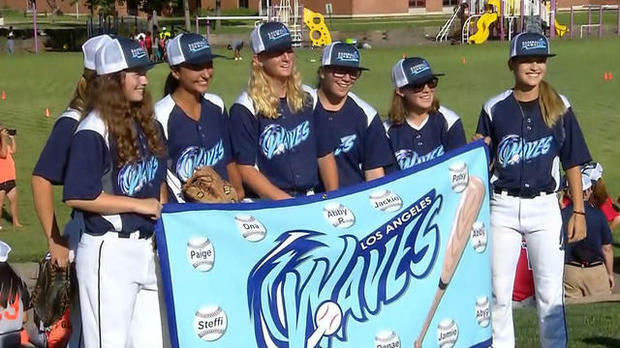 Women have made great strides playing professional sports, but tournament organizers say baseball still remains a few plays behind. Fifteen-year-old Kendra Levesque plays third base. When asked why it is so important to be around other girls at this level, Kendra replied, "Because other girls know what it's like to be a girl playing baseball on an all-boys team back home. They know the extra work they have to put in to be as good as, or better, than the boys." "I love this game," said tournament organizer Justine Siegal. "It's the greatest game on Earth." She's founder of Baseball For All, a group whose mission is to empower girls through baseball.Siegal grew up playing baseball. She says she realized she wasn't alone when she first saw "A League of Their Own," the 1992 film about the All-American Girls Professional Baseball League. Baseball execs created the league during World War II, while many major league players were off fighting overseas. Ninety-year-old Maybelle Blair and 84-year-old Shirley Burkovich once played for the all-female league. "We'll never have any Babe Ruths in the major leagues and we don't expect to," said Blair. "All we want to do is have a chance to play our own game."